Click on the artwork above to go to the Audible page. 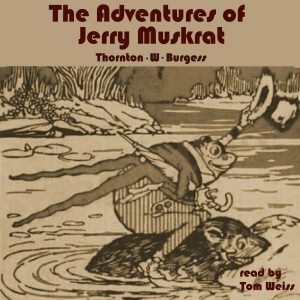 Jerry Muskrat lives in the Smiling Pool along with many of his friends, including Grandfather Frog, Spotty the Turtle, and others. One day Jerry discovers there is something wrong with the Smiling Pool and the Laughing Brook that feeds it. Both are slowly disappearing. Jerry and his friends set out on a mission to determine what is wrong with the Smiling Pool and the Laughing Brook. Once the friends learn what is causing the problem with the Smiling Pool and Laughing Brook, they also learn about cooperation and friendship. As with all Thornton Burgess books, young listeners are taught valuable lessons about nature and positive virtues of life.